כשהיא ראתה בבוקר את העוגה, היא מיד ביקשה ממני קוקיות, כמו הדמות שעל העוגה והלכה לגן כמו טווס גאה - כיף להיות אמא שלה! 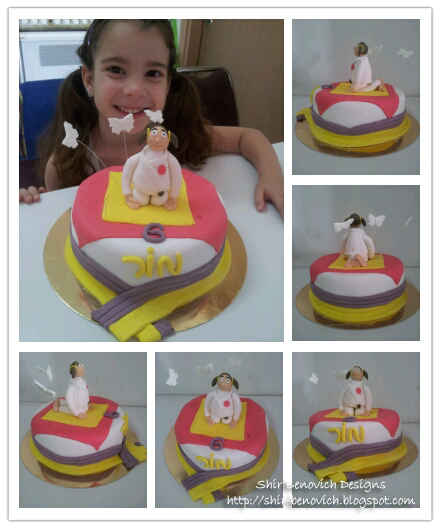 Mor celebrated her 6th birthday at kindergarten, and asked for a Judo cake (last year's cakes: here, here and here (different name)). She takes Judo class and got her purple-yellow belt a couple of months ago... She chose the colors she wanted and I started to work... When she saw the cake, in the morning, she was so excited she asked me to do her hair like the character on the cake. Love you sweetie, wish you all the best - always smile and make us smile too!